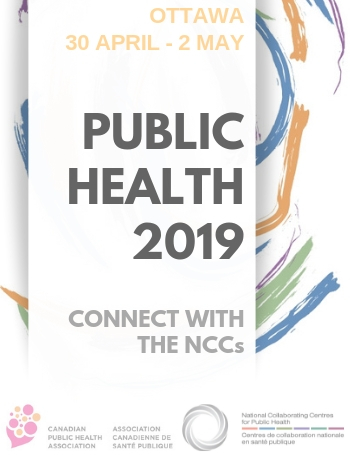 The NCCs are proud to be contributing partners of the Canadian Public Health Association's annual conference, Public Health 2019, held this year from April 30 to May 2, in Ottawa, Ontario. Register for our 2019 networking event, or visit our outreach booths in the exhibit area for publications and other resources from NCCAH and across the NCCs. Witness the 2019 NCCPH KT Awards ceremony that will be held during the plenary session on Wednesday, May 1st. KT Award Prize winners Steven Lam, Sherry Nesbitt, and Osnat Wine will also present their work during the NCC collaborator session to be held at 3:45pm to 5:45pm on Wednesday, May 1st. Sign up for Making Connections – a 5 à 7 with the NCCs and the Rural, Remote, and Northern Public Health Network our networking event to be held on Day 1 - Tuesday, April 30, from 17:30 to 19:30 in the Rideau Canal Atrium. Join the six National Collaborating Centres for Public Health (NCCs) and the RRNPHN for a dual language, interactive “5 à 7” networking event. Meet and connect with NCC and RRNPHN staff, as well as conference speakers and other CPHA 2019 participants. Learn about projects and explore new collaborative opportunities to strengthen public health in the rural and remote communities of Canada. Light snacks will be served and a cash bar will be available. Please note that regishttps://ccnmi.ca/qui-sommes-nous/tration is required as space is limited. Register now for the 2019 NCC Networking Event! Connect with members of the NCC staff team in the workshops, posters, panel discussions, symposium, and oral presentations listed below (updated as details become available). For more information, consult the conference program. "Walking in two worlds: Western and Indigenous knowledge needs, enablers, and barriers faced by Indigenous health practitioners"
"Children's perceptions of the Ontario student nutrition program’s Farm-to-School initiative in Southwestern Ontario"
Oral presentation by 2018 NCCPH KT Award Winner Paige Colley. "Shifting Perspectives - Knowledge Mobilization (KM) for TB Elimination in Indigenous Communities"
"A review of the impacts of energy efficiency initiatives on radon gas levels in residential settings"
"Mobilizing multi-sector knowledge for infectious disease public health - A new online resource for TB elimination in First Nations communities"
"Building organisational capacity for health equity action"
"Making Connections – a 5 à 7 with the NCCs and the Rural, Remote, and Northern Public Health Network"
A networking event organized in collaboration with the Rural, Remote, and Northern Public Health Network. Meet and connect with NCC and RRNPHN staff, as well as conference speakers and other CPHA 2019 participants. Learn about projects and explore new collaborative opportunities to strengthen public health in the rural and remote communities of Canada. Light snacks will be served and a cash bar will be available. A free event, but due to space limitations, registration is required. "2019 NCCPH KT Awards Ceremony" in Canada 1, in advance of Plenary II. Dr. Maureen Dobbins will present awards to Steven Lam, Sherry Nesbitt, and Osnat Wine. "Accessing the NCCMT’s capacity building resources remotely: Supporting the development of evidence-informed practice skills in a northern and rural/remote context"
"Addressing gaps to innovative STBBI testing strategies in Canada"
"Building a collaborative environment: Bridging disciplines of public health and planning"
"2019 NCCPH KT Graduate Award Winners Panel Discussion"
Featuring award winners Steven Lam, Sheery Nesbitt, and Osnat Wine. Moderator: Claire Howarth, Research Coordinator, NCCMT. "Black and Indigenous Public Health Gathering"
"Building organizational evidence-informed decision making capacity: Expansion of the online Evidence-Informed Decision Making Skills Assessment Tool"
"Enhancing health systems performance by learning from best practice models of public health and care for refugee population in Canada using an opportunity identification matrix"
"Free online-learning tools to support the development of health equity champions"
"Debunking 'race': contextualizing racial health inequities"
"Developing an online education course on health impact assessment (HIA) for increasing HIA practice in Canada"
"Aligning two worlds: what can AMR surveillance do for Public Health?"